Salt River AZ Tubing Trips? No Way! 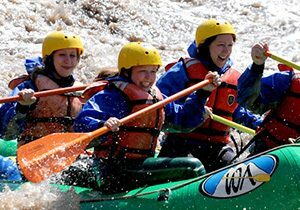 — This is a White Water Rafting Adventure! Arizona’s Salt River has unique characteristics not to be missed. 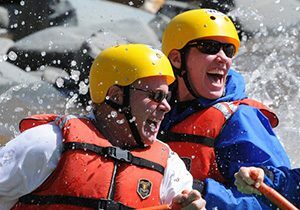 Not only are the rapids exciting with world class river-rafting action, Salt River rafting features stunning biological diversity and breathtaking grandeur. The Salt River is a non-regulated, free-flowing river that is dependent on snowpack. Run off is in the springtime, from late-February and through early-May on an average snow year. We raft commercial trips on the Salt River during run off only, and the season length can vary depending on how much snow the river basin receives. If you have any questions, at any time of year, regarding the Salt River – please don’t hesitate to contact us! 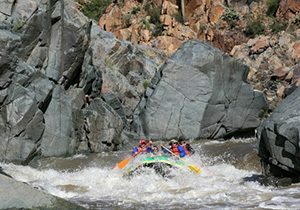 Salt River Rafting rapids are rated class III and IV. The Salt River drops an average of 25 feet per mile for over 50 miles through rocky, secluded canyons. It flows through oak and juniper woodlands down into stunning Lower Sonoran Desert vegetation, with giant multi-armed saguaro cactus and a diversity of other vegetation. Several side canyons reveal oasis-like microhabitats that are a lush reprieve from the prickly cactus environment. Excellent scenic riverside campsites are abundant and accessible only by raft. 10% off! Book and confirm any of our Salt River white water rafting trips before May 5th, 2019 and receive 10%* off our regular rates! Click into each trip for details! 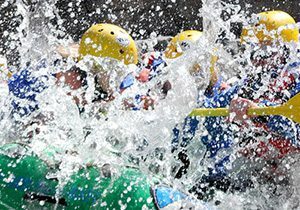 Raft with us on Arizona’s most popular white water rafting full day trip! 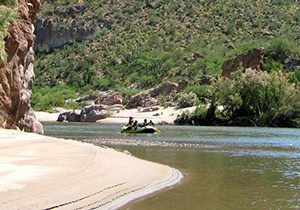 Fast-paced, exciting rapids greet you on this 10 mile Salt River journey located near Globe, Arizona – close to Phoenix and Tucson. All skill levels and kids ages 8+ are welcome on this springtime trip that departs daily from March-early May. Depart late and dash down the Salt River Full Day section, forgoing lunch for a small snack so you can take on as many rapids as possible! This action-packed trip departs near Globe, Arizona, a couple hour drive from Phoenix and Tucson. Suitable for all skill levels and kids age 8+, this trip is available March-early May. Get a taste of white water on the short and sweet half day Salt River trip! Rafters of all skill levels and kids ages 8+ can take part in this amazing trip between March and early May. Depart from the canyon just north of Globe, Arizona – a short distance from the cities of Phoenix and Tucson. Experience the action-packed and exciting Salt River full day section, with riverside camping and fresh meals the night before or evening of the trip. Depart near Globe, Arizona, close to Phoenix and Tucson, anytime between March and early-May. Suitable for all skill levels and kids ages 8+, this trip is great for families and groups alike. Enjoy rafting the entire distance of the stunning and isolated Salt River Wilderness on this fast-paced 2 Day trip. Departing just north of Globe, Arizona, close to Phoenix and Tucson, this remarkable trip is available between March-early May. Suitable for adventurous adults and kids ages 10+ looking to spend quality time on the river. This trip is an amazing adventure! 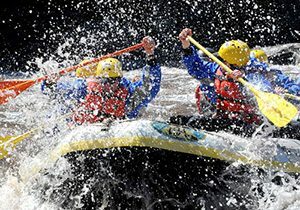 Raft miles of spectacular desert beauty and thrilling white water rapids on the incredible 3 Day Salt River Wilderness trip. Rafters of all skill levels and kids ages 10+ can experience this adventure, available March-early May. Departs near Globe, Arizona just a short drive from Phoenix and Tucson. This trip takes you deep into the heart of the desert! Travel deep into the grandeur of the Salt River Wilderness, and tackle exhilarating white water on this amazing 4 Day adventure. Trips depart just north of Globe, Arizona and the metropolitan areas of Phoenix and Tucson. Suitable for all skill levels, raft during March, April and early May with family, friends and kids ages 10+. Embrace and relish the Salt River lifestyle with amazing and exciting rapids, exploration and relaxation. Located near Globe, Arizona and the larger cities of Phoenix and Tucson, this 5 Day trip is a true getaway from the everyday. Available from March-early May, this trip is suitable for intermediate rafters, outgoing beginners and kids ages 10+. This trip is sure to be one to remember! Directions to our Salt River AZ Office – Our office is located at the base of the Salt River Canyon between Globe and Show Low, AZ. Salt River Map – Overview map of the Salt River showing section names, rapids and other features.